How to choose your Bridal outfit? A bridal outfit holds so much of importance in a girl’s life. It has to be perfect as the bride is the centre of attraction of the wedding. Every bride wants to find a wedding dress that makes her look like a dream and for that she has to go sifting through the dozens of dresses to find that perfect lehenga. There are many factors that are involved while selecting a wedding dress. 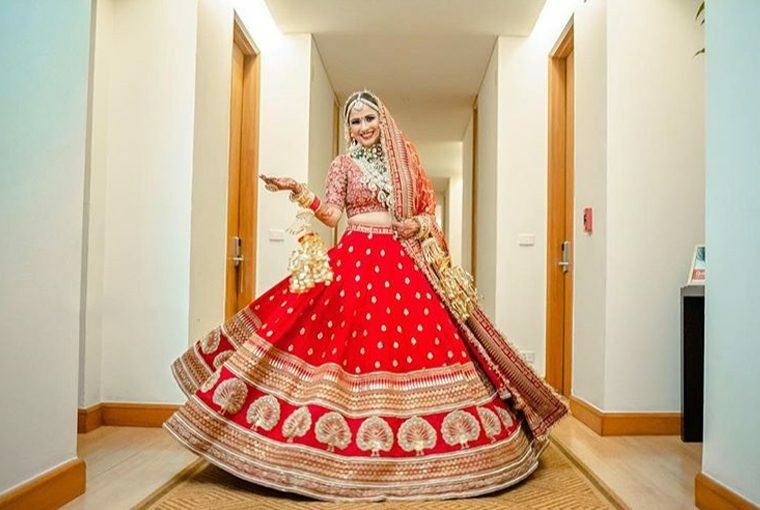 Here are some tips that you should keep in mind before you start hunting for that dreamy lehenga. The place and time of the wedding is the most important thing to consider while selecting the outfit. The wedding venues, as well as the weather, should be kept in mind while going for suitable fabric. Most fabrics are suitable year-round, but some, like net and organdy, are more appropriate for warm weather, while velvet and brocade or silk are best left for winter. Even these situations are a major factor behind the particular shades of lehengas. Before starting, browse through the latest dress trends to figure out which designers you like the best plus which ones are in your budget. It is always a good idea to explore online first then go into the markets or stores to look for the attire. Before you choose a store to visit, make sure that you have a price point stick in your mind. There are certain stores that or may not have lehengas within your budget, therefore be sure to check their website or call in advance. Even at the visit convey the price range beforehand, so that you don’t end up falling for the one that will give a shakedown to your budget. This is a really important mantra while buying a bridal lehenga. While shopping, go for trying those outfits as well that doesn’t seem like your style. There are some dresses that don’t look like much on the hanger but they may look great on you. We wish that these tips will be helpful to you and you get the lehenga of your dreams.